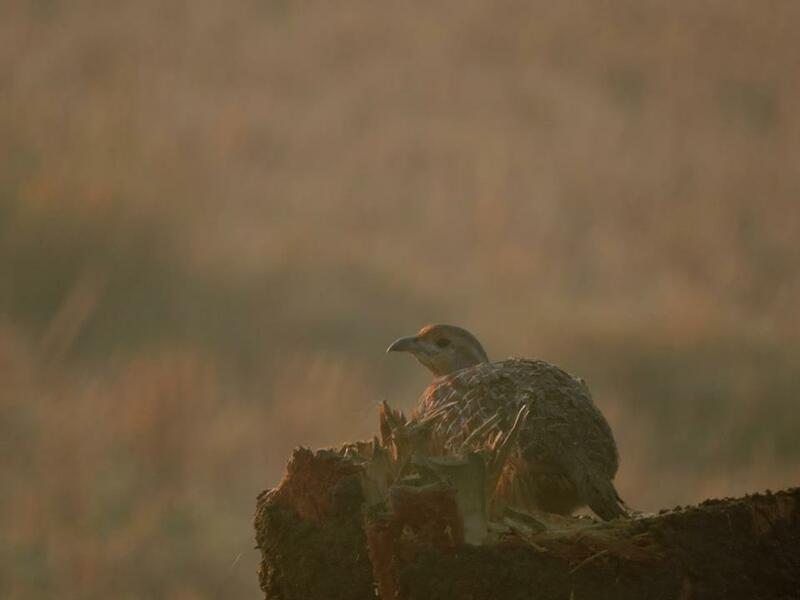 Grey Francolins are regular sights for birders during morning hours in the drier parts of the Indian subcontinent. They look like domestic hens dressed in sensible brown suits. As well-camouflaged as they are, Francolins are paranoid to the point of comic relief. We have made genial clowns out of each other. During my morning walks in scrub forests, I have startled them into skidding down muddy knolls. In return – they have knocked me off my sandals. It has been a match made in a Charlie Chaplin blooper reel. A year ago, they were also a part of a magical experience I had. While trekking with a fellow birder at the Tamil Nadu-Kerala border, we saw a family of Grey Francolins cross the road. Having spotted them before, we stood still. About a kilometre ahead, as we crossed a paddy field, three more Francolins hurriedly ran past us. Oddly, they were dressed in black. I immediately assumed they were Black Francolins. Having never seen this sub-species before, I photographed one of them for safe keeping. Soon, they disappeared into the golden hues of the fields. I noticed that my fellow birder wore a quizzical expression. It turned out there were some matters of immediate concern. One was that the Black Francolin happened to be the state bird of Haryana, a breeding resident (much like Bollywood) belonging to North and Central India. It was not found anywhere close to these southern parts. Also, the male of this sub-species had white spots on his body and a chestnut-coloured neck; the female was fully brown. The ones we had seen wore none of these colours. 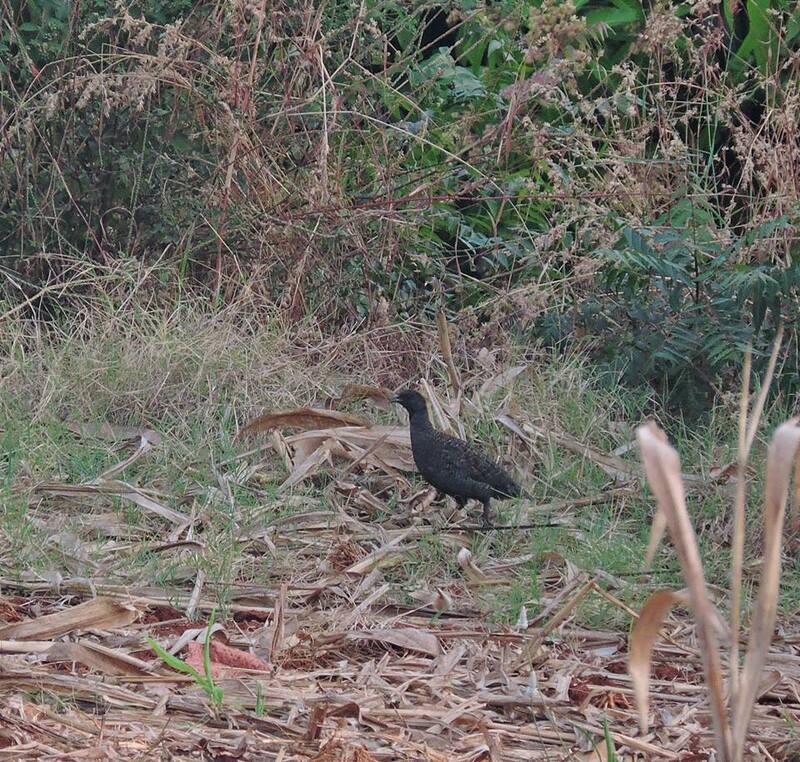 They were just plain black-coloured Francolins. He just could not wrap his head around it. He looked as though he had seen a unicorn. He quickly made a few calls before Whatsapping the photograph to people who could help identify the bird. Hours later, no one had replied. As we parted near the bus stop, he wore a look of befuddlement. It has been a year and we still don’t have an answer. We considered one possibility. Earlier, we had seen a fire in the nearby fields; one started by the crop owners to rejuvenate the soil the previous night. It could have been that three Francolins decided to roll around on a cooled-down bed of ashes before taking a stroll. Given that they had the exact colour patterns on their bodies, it would have been a remarkable coincidence. I am secretly glad that the mystery is still at large. So often we have processed information shoved down our throats. Unless we make an effort to pursue whatever we know nothing about, we may remain oblivious to the best parts of the universe. This case of the “Black” Francolin was a reminder to me that there are amazing facets to life; things I can hope to understood only by paying attention to the shades of grey that lurk out there. Wonderful! I agree. Mystery is beautiful. Yo.. 🙂 great to know…must’ve been a shocking n joyous at the time..
Methinks the name needs to be paired with a body part to sound authentic….how about ‘Soot backed Francolin’? Come ann. Sema name, Madhu. Totally approved! So cool! But often with mysteries like this once you start pondering you make mountains out of molehills – though this looks legitimately mysterious. Perhaps they’re melanistic? Very true comrade, sometimes all a mountain needs is dirt.